However, while they failed to destroy those sacred things, the protests do appear to have had more success destroying other things that Americans hold dear: like pizza and chicken wings. Only months after Papa John’s CEO John Schnatter blamed the NFL’s mishandling of the anthem crisis for plummeting pizza sales, a downturn in chicken wing prices has prompted a company called Sanderson Farms, to wonder whether the league’s weekly protests have hurt wings sales. During a conference call on Thursday, Joe F. Sanderson Jr, CEO of Sanderson Farms, expressed concern at the current state of the chicken wing market. “The only thing puzzling me right now is wings,” Sanderson said during the meeting. Wings had a banner year for much of 2017, boosting profits at processors like Sanderson. 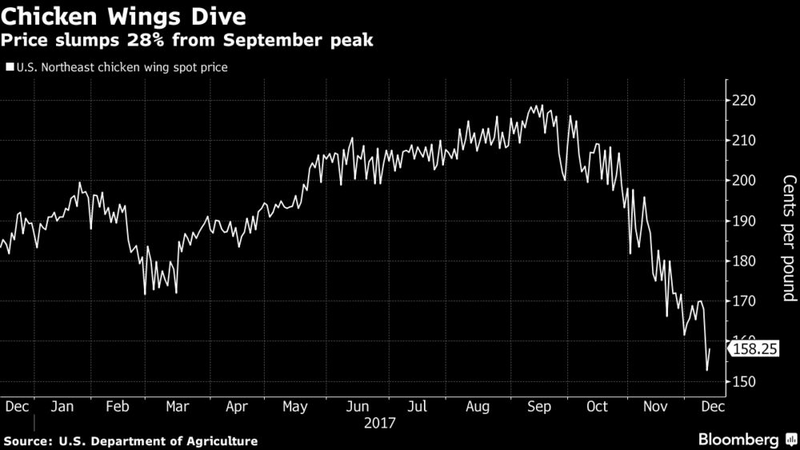 But spot prices slumped in each of the last three months and are now 14 percent lower than a year earlier, according to one U.S. government measure. Amid the NFL dispute, it’s unclear where prices are headed from here, Sanderson Jr. said. Food sellers have differing views on how much impact player protests during the national anthem at NFL games have had on revenue. Last month, Papa John’s International Inc. said the NFL flap was hammering pizza sales, but Wingstop Inc. said it hadn’t seen any impact from waning football viewership. While there are likely several explanations for the drop in chicken wing prices, one cannot dismiss that the chart clearly shows a steep, dramatic drop in prices at the start of the NFL season. In fact, it looks like prices consistently rose from March all the way up to September and then fell at a far greater rate than they had climbed. 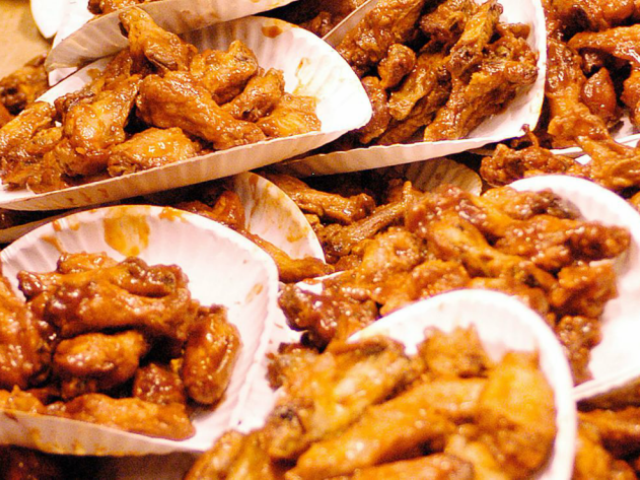 Other than the start of the NFL season, which should have been a good time for chicken wing sales, what else happened that would have caused such a precipitous decline? That kind of dramatic decline might be best explained by recalling the events of late September of this year. 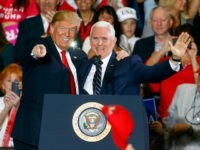 Remember, it was in late September, Week 3 of the NFL season to be exact, when over 200 NFL players, coaches, and executives; protested in some form or fashion after President Trump publicly criticized the NFL anthem protesters. After that weekend of protest, the NFL saw huge declines in ticket sales, attendance, and ratings. So why wouldn’t it follow that the fan backlash would ultimately effect the foods that most fans eat when they watch football? After all, less football would seem to mean you would eat less football food, right?